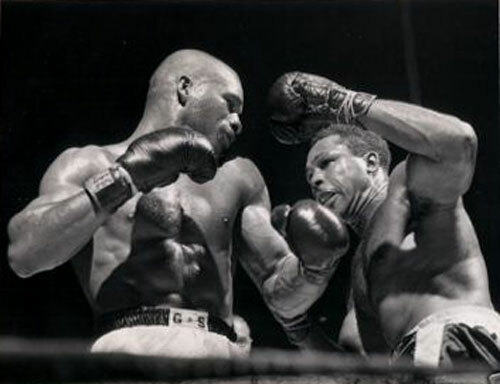 The light-heavyweight class has known far better boxers than Archie Moore in the last 20 years, but few who could have surpassed the exhibition of power punching with which the 32-year-old veteran from Toledo, O., trounced the previously undefeated Harold Johnson, of Manayunk, at Convention Hall last night. That Moore failed to score a knockout was not so much due to lack of accuracy or potency of his punching as it was to the stamina and gameness of his 21-year-old opponent. Even so, Johnson barley managed to last the ten-round limit. He was knocked down twice in the seventh round and was out on his feet through most of the tenth. To some of the 6,018 spectators, who paid $15,106.60, it looked as if Moore "let up" on Johnson in the closing minute. He was still swinging haymakers, however, up to the final bell, though missing many of them because Johnson's wobbly head refused to stay in place for him. Moore's victory qualified him for the final of the National Boxing Association's four-man elimination tournament to establish an American light-heavyweight champion. He earned the right to meet the winner of a bout in Cincinnati May 23 between Joey Maxim and former world champion Gus Lesnevich for the national title.